Workers from UNHCR's partner NGO load a truck with personal items belonging to refugees from Kasai Province, Democratic Republic of the Congo to take to their new accommodation at Lóvua settlement in northern Angola. 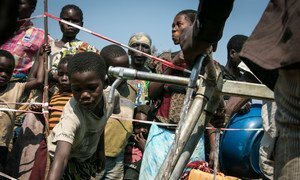 The United Nations refugee agency warned Tuesday that ongoing instability in the Kasai region of the Democratic Republic of the Congo (DRC) poses a grave risk to civilian safety, including for several hundred refugees recently returned there from Angola. Congolese Government forces have regained control of large areas of the Kasai, but there is sporadic fighting between the armed forces and militia groups, according to the Office of the UN High Commissioner for Refugees (UNHCR). “Tensions remain high between different ethnic groups, threatening to plunge the region into new violence,” UNHCR spokesperson Aikaterini Kitidi told reporters in Geneva. Last month alone, more than 11,000 people fled the conflict. This is in addition to the roughly 900,000 Congolese who have already been internally displaced since the Kasai crisis erupted in 2016. Some 35,000 Congolese have sought refuge in Angola. UNHCR believes that returns are not yet safe or sustainable, since peace and security are lacking. However, some 530 Congolese were forced to return from Angola between 25 and 27 February. “The returns were carried out despite UNHCR’s requests to the Angolan authorities to undertake joint screening of the unregistered group,” the spokesperson said. Support for the returnees to rebuild their houses is often absent, as humanitarian funding does not at present allow for a major rebuilding programme. For 2018, UNHCR has requested $368.7 million to help those affected by the crisis in the country. So far, just 1 per cent of this has been received. Escalating violence, daunting logistical challenges and insufficient funding have prompted the United Nations food relief agency to broaden its emergency operation in the war-ravaged Kasai region in eastern Democratic Republic of the Congo (DRC).